A wonderful atmosphere surrounded the ESS stadium this afternoon as crowds had eagerly awaited the arrival of his holiness the Dalai Lama. Today’s visit, his second to the town of Aldershot was even more poignant as it coincided with the upcoming celebrations of his 80thbirthday next week, and the opening of the new Buddhist temple recently constructed by the Buddhist Community Centre, UK. 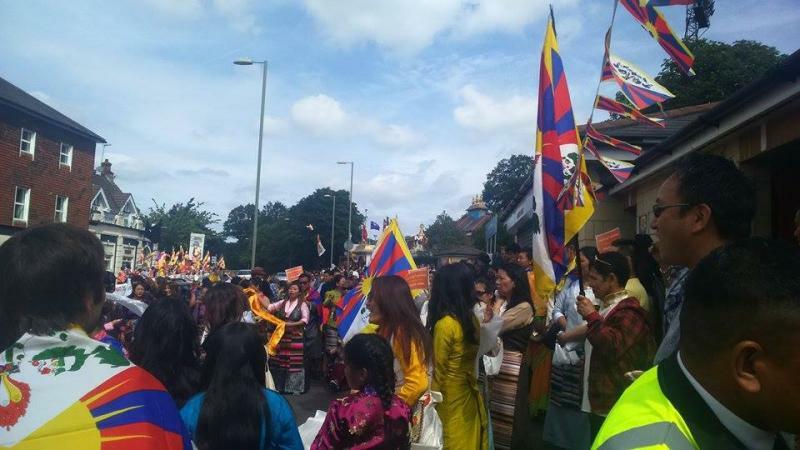 The Temple constructed in Aldershot is believed to be the first monastery inaugurated by the Dalai Lama in the UK, of which he has agreed to be a patron of. The Dalai Lama was welcomed with warmth and rapturous applause, and eagerly watched over a number of ceremonial dances and speeches after a minute of reflective silence to remember those affected by the recent earthquake in Nepal. Presents were offered to his holiness to mark his birthday followed by a specially prepared birthday song performed by the members of the Buddhist community centre. The wit and charm of the Dalai Lama´s speech was enjoyed by a broad spectrum of people from all sectors of the community. The Mayor of Rushmoor, councillor Michael Tennant mentioned in his speech that it was a fitting place for his holiness to visit, referring to the ESS stadium as being the centre of ‘civic pride’ for the area.